Most Venerable Napana Premasiri Thero has been appointed as the new Mahanayaka of the Ramanna Maha Nikaya, the Chief Secretary of the Ramanna Nikaya said. The decision was taken by the Committee of the Supreme Council of the Ramanna Chapter which gathered at the Meerigama Divisional Secretariat this morning. Premasiri Thero, the Chief Incumbent of Menikhinna Hurikaduwa Vidyasagara Pirivena, fills the post left vacant following the passing away of Most Venerable Weweldeniye Medhalankara Thero. Ven. 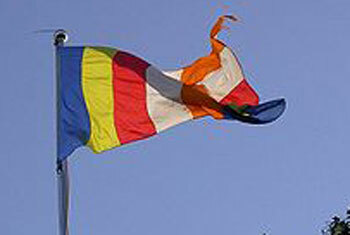 Premasiri Thera, was previously holding the position of Adhikarana Sanghanayaka of Ramanna Maha Nikaya. It is said that as per tradition of the Nikaya, it’s the Adhikarana Sangha Nayaka Thero, who is appointed as the New Mahanayaka.